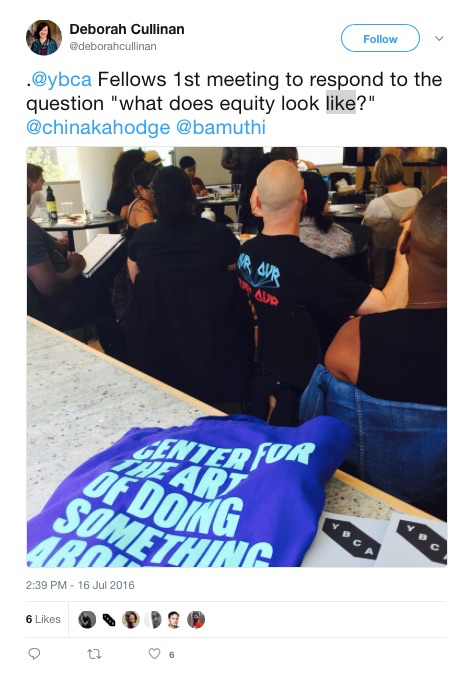 http://www.emergingsf.org/wp-content/uploads/2017/08/ybca-tweet.jpgIn July 2016, San Francisco’s Yerba Buena Center for the Arts gathered 30 artists, researchers, educators, tech workers, organizers, and lawyers to explore the question: “What equity looks like?” As part of the first year of the YBCA Fellows initiative, the Equity Fellows bridged different sectors, disciplines, political projects, and personal experiences. As they prepare for the Equity and Citizenship Public Square on August 19, in this post, Katherin and Trisha seek to understand their cohort’s process by reframing the central question as: “What does institutional access look like?” For this reflection they will share the process for self organizing among the Fellows, communication with the institution and staff, and how they came to the reframed questions. Growing up moving between Oakland and San Francisco, Katherin Canton envisioned living in a community that values creative and cultural expression for all to participate in. As the eldest being raised in a single-mother household, Katherin realized early on that our social support systems and government policies are not centered on dignity and has been searching for ways to shift that ever since. In 2011, she earned a BFA from California College of the Arts, with an emphasis in Community Arts with a studio practice in photography and textiles, this is when her weaving practice began in honor of the cultural practices from her Guatemalan heritage. While at CCA, she was the administrator and Community Collaborations Director at Rock Paper Scissors Collective (Oakland, CA), where she developed funding, business, and partnership processes that supported local youth fashion/art Interns, grew a local apparel/art boutique, and nourished connections between artists and neighbors through exhibitions. Katherin currently organizes with the U.S. Department of Arts and Culture across the West Coast, supports operations for Peacock Rebellion (a SF Bay Area -based, queer + trans people of color crew of artist-activist-healers) and consults with the Housing Rights Committee of San Francisco. As the Co-Director of the Emerging Arts Professionals SF/BA she strives to build a visible network for cultural workers, Bay Area residents, local/small businesses, and government to communicate and share resources.